Version 4.08 now available, including Microsoft® Agent Technology. Now with optional separate time bands for each user, and 15 minute periods! Whenever the computer starts up, Quality Time is loaded before any other programs. Just select your account name, enter your password, and press the Login button, and the clock starts running. When a user's time is up, the software pops back on top, and prevents them from running any programs. It also prevents inquisitive users from ending the program with CTRL+ALT+DEL or by switching away to another program. You can be assured that the computer will only be accessed during the allowed times. To help users manage their time, Quality Time issues a five minute and a one minute warning using Microsoft® Agent Technology. 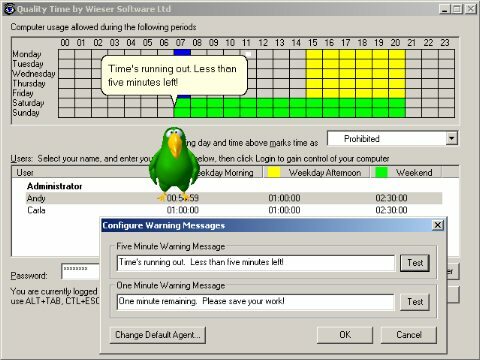 The image below shows the Microsoft® Peedy character giving the five minute warning. Quality time allows up to 10 users, in order to support large families, and up to three different periods. The software labels them Weekday Morning, Weekday Afternoon, and Weekend to allow you to set up times before school after school and at the weekend for each user. These names are only suggestions though, and you could think of them as simply three different periods (yellow, green, and blue). See our FAQ for more ways you can use the periods. Quality time also allows you to generate a simple report of computer usage for each user for the past week. Just login as the administrator, click the report button, and paste it into your word processor or spreadsheet. Draw out the times the computer is allowed to be used in the three different bands (labelled Weekday Morning, Weekday Afternoon, and Weekend). After that, you can just sit back and let Quality Time do the rest! Quality Time costs just $19.95 and you can download a no-obligation 7 day free trial by clicking on the link above.